There are bits of technology we remember from our childhood that stay with us through our entire lives, and while the Etch a Sketch was never really cutting-edge computing (though Dilbert's boss may beg to differ), we still remember it with fondness. That’s probably why an intrepid YouTuber named Alpinedelta32 improved the Etch a Sketch UI by jury-rigging it with a Nintendo controller. That’s right, kids: Instead of cranking away on two round knobs, you can now use a D-Pad to create your single-line masterpieces. Frustrated (like the rest of us) by the limited controls, he undertook to do what all geeks do: Make it better. 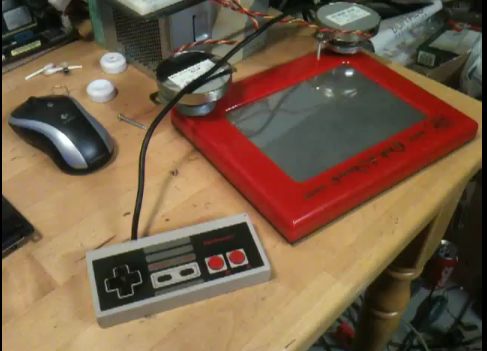 Amusingly, its a bit of a “double retro” experience: The Etch a Sketch combined with the NES controller is a one-two punch of toys that those under 25 years of age only know in the ironic, hipster sense. Some of us (not naming any names) are old enough to remember when the Etch a Sketch was brand new, and even then we thought, "How the hell am I supposed to draw with this thing?" The NES hack might just be your key to sketching up some of those amazing masterpieces you see people create with that single line on the dull silver canvas. It’s not a pretty hack. But is it cool? Yes. Yes it is.